Local fashionistas are in for a treat this summer, with some of the most iconic images from the past century of fashion on show at the Gold Coast City Gallery from Saturday. Conde Nast, the publisher of magazines such as Vogue, Vanity Fair and GQ, has opened up its photography archive to put together an exhibition called Coming Into Fashion: A Century of Photography at Conde Nast. The exhibition showcases incredible fashion imagery from the past 100 years, includes shots by Cecil Beaton, Irving Penn, Helmut Newton and Mario Testino, as well as a selection of vintage couture fashion from The Darnell Collection. Gallery Director Tracy Cooper-Lavery told myGC in addition to the exhibition, there will also be talks and films for locals to enjoy. What: Hosted by local personalities, John Kerr and Danielle Goullet, the Runaway Bay carols will feature Santa, a live seven piece band and entertainers; Rhydian Lewis, Kathleen Moore, Jack Watson and Kiara Rodrigues. 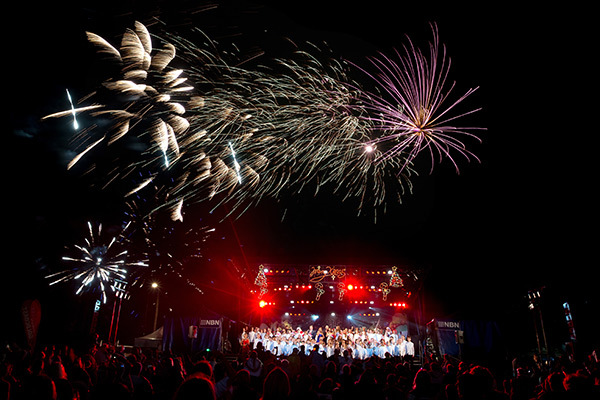 There will be performances by local school choirs, acrobatic and dancing squads, followed by a Fireworks Spectacular at 8.15pm. Where: Firth Park, Somerset Drive, Mudgeeraba. What: Bring the family, a blanket and some Christmas cheer, and be part of a community carols event showcasing local schools and other community groups. What: This will be a community carols night filled with food, coffee and singalong. There will be jumping castles, a petting zoo, games and face painting all free for the kids. So bring your family for an evening celebrating the festive season. What: Singing superstar Christine Anu will headline the night, along with special guests Emma Pask and Prinnie Stevens. 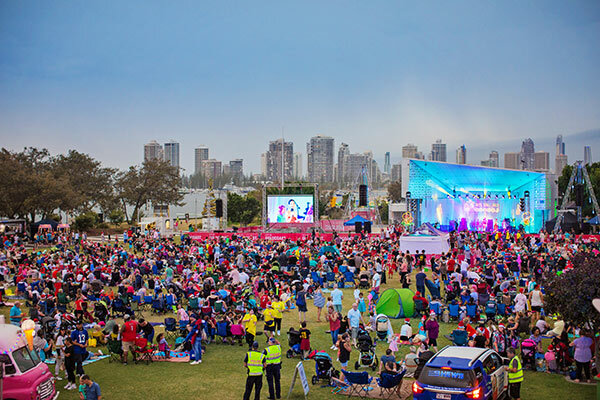 The free family event will be hosted by Channel Nine’s Shelley Craft and will feature an entertaining Smurfs Christmas Show for the little ones, a bunch of food trucks, and of course an appearance by Santa himself. Interactive kid’s fun commences at 2pm, with the main show kicking off at 5pm. To conclude the evening, a spectacular fireworks show will light up the night sky at 9pm. What: There will be face painting, raffles, delicious street food trucks, jumping castle, Santa will arrive in a police car, carols with the Salvation Army Brass Band, and a kid’s movie. Money raised will go to the Elanora Salvation Army Christmas Appeal. What: Families can enjoy an afternoon and with a free screening of the 2003 Christmas movie Elf, starring Will Ferrell. There will be Christmas tunes and a special visit from Santa and his elves, as well as face painting and activities for the kids commencing from 4.30pm, with the movie screening at 7pm. What: Enjoy some live Christmas Carols including a visit from Santa. Bring the family along for a night of fun, and enjoy a community barbeque on the night. What: The 23rd annual Studio Village Community Carols will see a number of performers return to entertain and some new faces. Enjoy international food vendors, Santa Bugs, Santa, fireworks and much more. What: Celebrate the festive season with a host of kid’s activities from 3pm including rock climbing, a jumping castle, face painting, family photos as well as plenty of other family fun. The Broadbeach Christmas Carols begin from 6pm boasting a phenomenal cast of performers including Marina Prior, a special visit from Santa and his elves, as well as a breathtaking fireworks display at the conclusion of the concert. What: Have a sing along to some Christmas Carols with local entertainers. There will be market stalls, food trucks, a giant snow globe, glow stick products, raffles, rides and finishing with fireworks at 8pm. Santa will also be there. What: This is a free community Carols by Candlelight event with live stage entertainment, food and drink outlets, and an appearance by Santa. What: From 4pm children will be able to enjoy the free rides, face painting and meeting the famous Ormeau Carols character hosts. There will be some of the Coast’s favourite food vans serving delicious treats and meals. There will also be a visit by Santa, with the concert set to begin at 7pm. What: Witness a world-class laser light show and celebrate the festive season with song and dance. The free family event will have children’s activities, food trucks, live entertainment and a traditional Christmas carols concert with a special guest appearance from Santa. What: Christmas by the Sea is a free family annual community event held at the Palm Beach Parklands. There will be Christmas carols, face painting, barnyard animals, live entertainment and a visit from Santa. What: Enjoy plenty of Christmas songs and a visit from Santa himself. There will also be face painting and glow sticks available. Families can book in at the Waterfront Restaurant or bring deckchairs and rugs and enjoy the event on the beach. What: The evening will begin at 5.30pm with entertainment for the children by the magician, Awesome Adam, and then a visit from Santa at around 6.30pm. The carols and entertainment will follow with the night concluding with a firework spectacular. What: There will be a line-up of fantastic artists such as Memphis Moovers, up and coming girl sensations Chasing Velvet, Andrea Gallaher and VOX studio performers, D and D Performing Arts Dancers. Seasoned entertainer, Jo-Dee McLean and Valerie Edwards will also be there, plus a special appearance from the one and only, Santa. What: This is a free community Carols by Candlelight event with live stage entertainment, food and drink outlets, an appearance by Santa and fireworks. What: A stage set on the beach will feature a stunning line-up of talented local musicians and dancers and the will finish in a flurry of fireworks. What: Bring the family along to enjoy an array of fun activities and then sing along to some carols in a great park setting. Three baby squirrel gliders are being hand raised at the Currumbin Wildlife Hospital after their mother was sadly taken by a cat. Vet Andrew told myGC the squirrel gliders have been in the care of the hospital for 120 days, and weighed only 15 grams when they were first brought in. Outsourcing care: a blessing or a curse? I read, with a little amusement, this blog article by a mum who ponders what life would have been like raising kids in the 70s. The overall vibe of it was definitely appealing. Lazy days spent watching soap operas while hubby works; kids who take themselves off to school unsupervised; babysitters you can book for $1.50 an hour: this is definitely a lifestyle I could get on board with! It got me thinking about how much times have changed – namely, how much busier we’ve all become. Being a full-time stay at home mum nowadays is a very different proposition, as those parents who don’t work do a lot more than watch TV all day. There are schedules to organise, bills to pay, meals to prep, activities and events to plan, school tasks to sort out, kids costumes to create, playrooms to clean… the list goes on. One of the things that has seriously changed, I’ve noticed, is the outsourcing of care. We’ve become so busy that we don’t have as much time to care as we used to – and I’m not just talking about childcare and aged care. I’m talking about all the little ways in which we show care to our community. For instance, in the past, if someone in your village was sick, or had a baby, or had fallen on hard times, people would rally around them. Children would be collected from school and looked after! Casseroles would be made under a meal roster! Friends and family would pop by and lend a hand! These days, our villages have scattered. We’re all overscheduled and overwork, and we often outsource the little moments of care that we used to do ourselves. We pay cleaners to tidy up after our busy families. We buy meal deliveries to take care of cooking. We enroll our kids into childcare centres. We admit our elderly into care facilities. And we do it not because we don’t care, but because we don’t have the time and energy to do it all ourselves any more. Is this a blessing or a curse? On one hand, it’s wonderful that we have to ability to lean on support services so we’re not stretched too thin. On the other hand, heartbreaking stories like this one make me think that perhaps we’ve come to rely too much on outsourcing, without enough quality control along the way. I don’t know whether our society has evolved for the better or worse. And we can clutch onto some some parts of the 70s if we want too – we can even still get our hands on Gee, Your Hair Smells Terrific! http://www.mygc.com.au/wp-content/uploads/2017/11/Busy-Mother-at-home.jpg 321 845 The Meddler http://www.mygc.com.au/wp-content/uploads/2016/04/mygc-logo.png The Meddler2017-11-21 08:42:152017-11-21 09:04:46Outsourcing care: a blessing or a curse? SPORTING fanatics have been given one last chance to snap up tickets to next year’s Commonwealth Games on the Gold Coast, with the final major release set to go on sale to the general public today. The Gold Coast 2018 Commonwealth Games Corporation (GOLDOC) will release the last 300,000 tickets to the general public from 12pm Queensland time on Monday (1pm AEDT). Along with 200,000 tickets that had previously been set aside for the final release, organisers have managed to free up an extra 100,000 seats after completing venue seating plans, sight lines and camera positions. The additional 100,000 tickets also include those returned from Commonwealth Games partners and associations. This means there are still tens-of-thousands of seats to be snapped up in the Opening and Closing ceremonies, as well as tickets to some of the most sought-after events that have been oversubscribed since the ticket request phase closed in May. 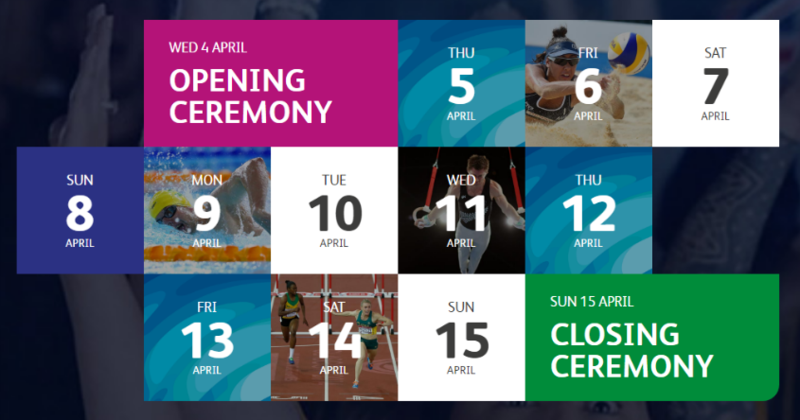 In all, the additional tickets will be available for 21 of the 23 sporting events, including the Swimming, Diving, Track Cycling, Gymnastics, Beach Volleyball, Netball, Athletics and Wrestling. The ticket allocation for many of these sessions had previously been exhausted. To check ticket availability for each event, click here. 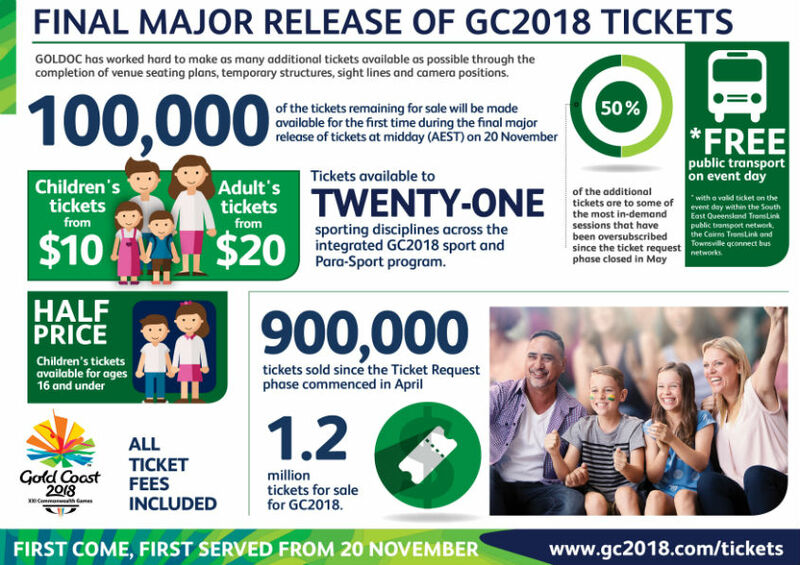 Tickets will be offered on a “first in, first served” basis through www.gc2018.com/tickets, so fans are being urged to get in quick to avoid disappointment. Prices will start from $20 for adults and $10 for children with each ticket including free public transport on the day. The games will be held during the 2018 Easter school holidays, from April 4 to April 15.